No matter how much I try to make time for writing, obligations emerge to consume it. Last time we headed off for a break I seriously considered taking my laptop along in case I got an hour or so to write. The trade off was that I would need to leave it in the car for long periods and as my entire life is on the thing, I would be constantly worried. My next bright idea was to buy a small netbook to work on. I could load scrivener on it and it wouldn’t be a disaster if it was stolen. Scrivener … I love it as a creative tool, it let’s me keep my notes in step and control my writing in a collection of small documents. Of course even a netbook costs money, plus I always take at least one tablet away with us. A tablet and a netbook is too much tech! I’d never avoid a nagging. Hang about, didn’t I see Scrivener was available on Ipad? I’d initially dismissed it as a frivolity. Plus, at fifteen quid, it felt rather too expensive. The fact I spend hundreds on PC software for my day job was irrelevant. So, my new portable writing kit is an ipad mini 2. Much as I dislike apple, I had to buy it for a work project and I can’t bring myself to completely discard such an expensive thing. 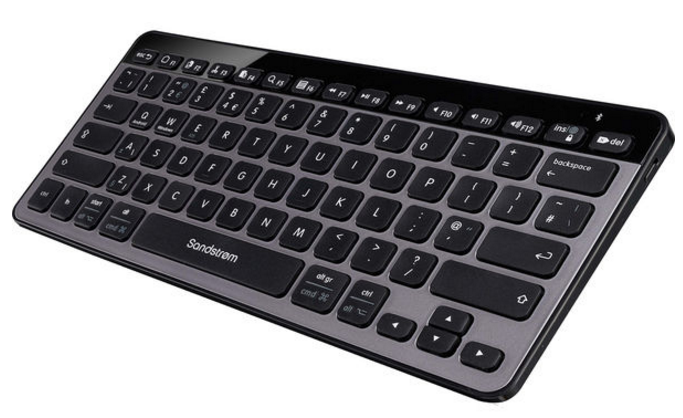 The final piece of the jigsaw is a small bluetooth keyboard. Seeing as my ipad is a mini, I thought the screen would be too small with the onscreen keyboard displayed. Also, I’ve tried to type properly on it and the lack of feel slows me down. Is it going to work? I have no idea. Over the years I’ve tried just about every combination of portable tech and failed to be productive on anything less than a full PC/ Laptop. From palm pilot, to tablet, I just can’t be creative on them. One thing is certain, I am impressed with Scrivener for IOS. Of course I wish it had been on Android, but as Scrivener is primarily an Apple piece of software reluctantly moved onto PC, I doubt it will ever appear on Android. Although it is cut down from the desktop product, it has all of the functionality I’ve needed so far. Stay tuned for how well it works! This entry was posted in Personal, Writing on January 14, 2017 by Eric Tomlinson.